A new horror movie that may go too far. I caught Sun Choke during last year’s “Bruce Campbell’s Horror Film Fest” (the new one is this weekend and Patrick and I will report on the fest next week) and I honestly didn’t know what to make of it. The movie played on what was perhaps the most schizophrenic day I can recall having in a movie theater. I started by seeing the notorious Cannibal Holocaust, then the delightful Turbo Kid, followed by the disturbing Sun Choke. I don’t think I realized how unsettling Sun Choke was at the time because I had seen it on the heels of Cannibal Holocaust. Any movie seems like a walk in the park after turtle murder. After revisiting Sun Choke on VOD last night, I can now say that it’s a movie I admire and one that is also completely mysterious and haunting in a way that makes me uncomfortable. The plot in brief: Following a breakdown, Janie (Sarah Hagan, Millie from Freaks and Geeks) is sequestered in her lavish home under the watchful eye of her lifelong caretaker Irma (Barbara Crampton). Irma subjects Janie to an elaborate health and wellness regimen intended to steer her on the road to recovery. After some initial progress, Janie is allowed to briefly leave her house and soon develops on interest in a young woman named Savannah (Sara Malakul Lane). JB and Patrick did a podcast once about horror movies that “go too far,” which is something I kept recalling as I watched Sun Choke. There are certain scenes in Sun Choke that do go too far (a murder is too explicitly shown imho; a person being held captive is humiliated in an extended sequence, etc.) but the real reason the movie goes too far for me, and a reason why I think Sun Choke is so powerful, is because it’s a movie that doesn’t offer easy answers. It’s confusing and offers little clarity in character relationships and motivations as it plays out. The unknown element makes the movie feel dangerous in a way that horror films seldom feel. Horror movies usually have a third-act reveal detailing why the players are the way they are and what events led up to their horrific moments, but Sun Choke is like Stanley Kubrick’s The Shining in that everything seems at once one thing but there’s a layer of peculiarity and uncertainty to the proceedings that makes everything else feel off. Sun Choke is very much an art project (sometimes more than a satisfying narrative) and I think that gives the movie a subtle power. It demands you think about it as you watch it. Is insanity nature or nurture? Do terrible things happen because of sheer chance or are there specific motivations? etc. I brought up The Shining before not because I think Sun Choke is as good as Stanley Kubrick’s classic but because I think it shares a quality with it. Both movies are ones where you feel like you (as a viewer) are dropped into a situation of doom and you are helpless to do anything but observe. Both films are insulated in the sense that the major players feel set in motion and the events to follow are inevitable. This is a rare quality in a horror movie, and as a calling card and early-career feature, writer-director Ben Cresciman has made a pretty special film. I once heard a quote that directing is largely “managing tone,” and Cresciman excels at that in Sun Choke. It feels accomplished and confident in a way that the work of early independent filmmakers normally does not. The cinematography, score and sound design all amplify the dread and the production design gives the movie the sense that it is in a hermetic bubble where rules are arbitrarily dictated by the ultra-wealthy and common sense/law & order does not apply. You feel trapped while watching Sun Choke, but in a good way – the way that disturbing horror movies make you feel when they want you to squirm. I also want to give massive kudos to the performances in the film. It’s mostly a three character piece and all three actresses are very strong. Sara Malakul Lane brings the necessary center to the movie. She’s the audience conduit in a way because she is “one of us” dropped into the den of a couple of figurative wolves. Those wolves are played by Barbara Crampton in a performance that is even more impressive because it’s so atypical to what we are used to seeing from the actress. She gets to play very dark here, and I think the audience’s relationship to her past performances helps to make her part in Sun Choke that much more disturbing. And what can I say about Sarah Hagan in this movie? I thought she was great in Freaks and Geeks, but this is the type of performance that can really knock you out and reconsider an actor’s range. When I first saw Hagan in Sun Choke, I felt protective of her because her past roles have portrayed her as this sweet, innocent girl and that really gives her leeway to pull out the rug from under you with this performance. It’s basically her May. 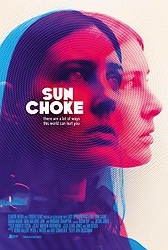 If you are a horror fan and don’t mind being disturbed, I strongly recommend Sun Choke. It’s an experience to watch and another example of how exciting the independent horror scene is in recent years. And if you are in the Chicagoland area, attend the Bruce Campbell Horror Film Fest this year. It runs from August 18 to August 21st in Rosemont. It’s become a must-attend event and has introduced me to some of my favorite movies of recent years, including Tales of Halloween, Turbo Kid and Starry Eyes. The fact that Sun Choke is in the silver medal category just exemplifies the strength of the lineup. Hope to see you there! Just don’t Sun Choke me afterwards? P.S. If you see Sun Choke and have a theory about what a “sun choke” is, let me know. I think I get it but I’m not sure. That movie holds a very special place in my horror heart. I checked it out from the library probably 10 or more times during the summer of '93. It is partly responsible for hooking me on horror. I'd like to know any theory about the title as well. I didn't really understand it. I thought the film was great. All of the performances were awesome and the production all around was top notch. Ultimately, it's a very heavy film at times and painfully tragic. Was that flashback to show that particular psychotic episode was what caused her dad to leave? Who were the people that were holding her and why was this particular episode of importance? There is so much of this movie that confuses me and that flashback is one of them. I think they're deliberately withholding information from us, the audience. I haven't seen the movie (though Adam, your review really piqued my interest) but I know one thing a sun choke is: it's a flower with a root you can eat. Pilgrims ate sun chokes. Like a weed but you can also grow in gardens to harvest and eat. Don't know how (or if) that relates to the movie though! Dammit I really wanna watch this now but afraid it'll f me up. I think I'll save it for my wake up and turn something on weekend movie. I usually respond better to movies like this in the daytime. Oh I am completely the same - for some reason the sun helps.